Carl Kolchak has heard about two professors from Duke University who seem to run into the bizarre almost as much as he does. Falling asleep, Kolchak enters the dreamplane. The two professors from Duke University are Drs. Hugh Blakely and William Boles, who appear appear in a series of stories by Henderson and Bruce Gehweiler that are collected in Where Angels Fear. The dreamplane is from Henderson's novels featuring Teddy London, a private eye who regularly encounters the supernatural. This novel takes place in March, two years after Kolchak's first encounter with a vampire in The Night Stalker. Since Win placed The Night Stalker in 1970, I have placed The Lost World in March 1972. As with other Kolchak stories published by Moonstone, I am ignoring contemporary references such as the Internet and Secretary of State Hillary Clinton in order to maintain Kolchak's adventures in their original time frame. I rather wish Moonstone had done the same, regarding the time frame. Yeah, I wish that too. Kolchak seems to work better in the 70s. I wasn't thrilled by the Lost World in general. 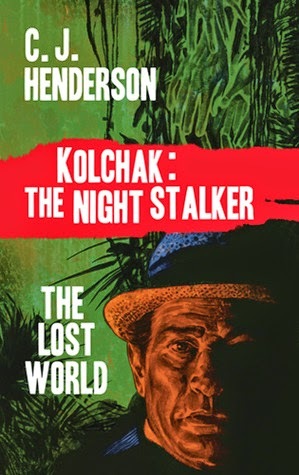 That said I really liked Henderson's Kolchak: The Lovecraftian Horror.